You’ll have to forgive me as I’m still dusting off the old quill and parchment in order to document the exciting months to come. The rehearsal room seems deserted but that could be a Blackwall Tunnel/Hammersmith & City standard disaster. Plan of Action! Hasten towards the 3 Mills penthouse – our rehearsal space for the next 4 weeks, find some caffeine and potentially a sweet snack of some description to tide us through until tea break. I reach my destination, eagerly tug at the door and am bowled over by what I am seeing before me. A room FULL of people (69 to be exact, which must be must be some kind of record for a Day One Meet & Greet) and an exhilarating energy of a great ‘first day’ is already in full swing! Of course with The Who’s Tommy being the second of the Ramps On The Moon productions (following the sensation that was The Government Inspector), we were joined by representatives from each of the consortium venues (New Wolsey Theatre, Ipswich, Birmingham Rep, West Yorkshire Playhouse, Nottingham Playhouse, Theatre Royal Stratford East and Sheffield Theatres) plus our wonderfully extensive Creative Team, Stage Management, Technical Gurus…oh and a cast of 22 (including one Peter Straker who also appeared in the original West End production of the show in 1979). All in all, that was one gloriously busy room! The vibe is an electric one, the model box of the set looks epic. Kerry Michael (Director) is particularly excited about the ‘prop furniture’ to come (*NO SPOILERS* but it’s apparently set to be pretty damn fine ‘prop furniture’). Together we discuss the logistics of how to embark on such a project and all agree that whatever direction the journey takes, we’re all going to love being on that train! So week 1 we got stuck in! Piles of singing was done (with Pinball Wizard sounding particularly awesome), piles of instruments were played, piles of choreography was danced and, for me, the most fascinating side to all of this was watching Jeni Draper and Daryl Jackson (the British Sign Language dream team) demonstrate how the BSL was going to be integrated into all of the above. 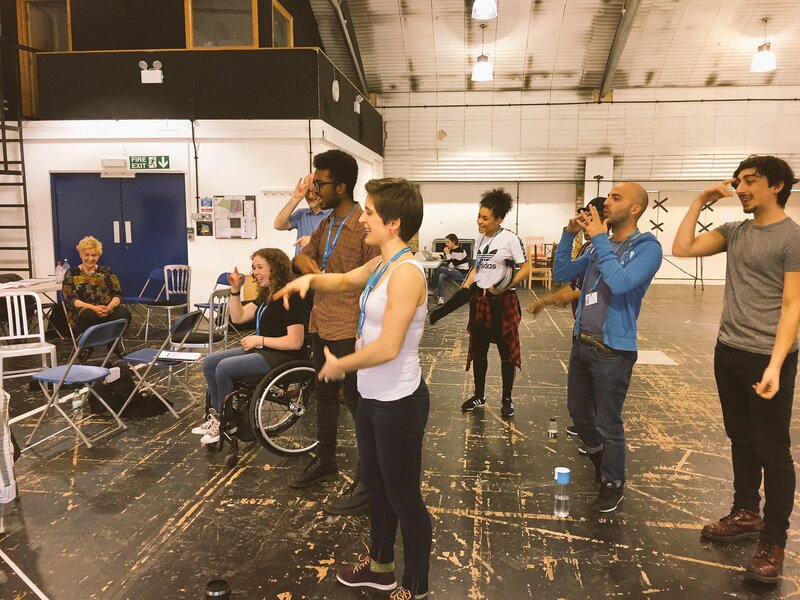 Seeing as we were all approaching BSL from different levels we found common ground by learning to sign along to our tongue-twisters in our daily vocal warm ups. I challenge you to work out the BSL for ‘Great Greek’s Sheep’s Cheese’ and do it at speed with words. Find me, show me and prizes shall be awarded! (Although I have a feeling that Steve, our handsome bass player, shall still be perfecting the ‘www’ of ‘World Wide Web’ by the time we reach Sheffield – our final venue!). Week 1 is also inevitably about getting to know your compadres and with so many fabulous characters in the room I have no doubt that the next 5 months are set to be filled with much joy and mayhem! On Day 3 we had already learned that our beautiful Donna (Mrs Walker) likes a wild night of ‘ping pong’ to chillax while Max (Mr Walker) prefers an evening in with Alan Partridge… opposites attract I guess! With his Musical Director hands very full at the moment, our MD Rob Hyman had been powering through harmonies at the rate of knots but did hasten to add that “Dropbox is not my first language” so, guys, maybe record stuff just in case! My moment of the week so far goes to the wonderful Lukus (Cousin Kevin) who boldly announced on Thursday (a good day to announce stuff I think) that “the music for this show was written by the same guy that wrote the music for ‘Snoopy-The Musical'”. (I look forward to hearing more from Cousin Kevin in the coming months!). So hopefully you’ve had a flavour of what we’ve been up to in order to whet your cheeky appetites and will stay tuned for what is in store for the #TommyTour in Week 2. ‘Til next week you Pinball Wizards… Bye!